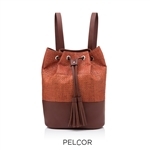 Bag that combines cork skin and leather in two contrasting colors, with double functionality: it can be used as a backpack or cross-body. With an urban and fun look, this accessory is ideal for your daily needs. The unexpected combination of colors gives it a contemporary look. It has 1 exterior pocket and 3 internal pockets, one of them padded, for better storage. Urban backpack in engraved cork skin with a subtle shine and an aged washed effect. With a cool and trendy design, this material gives it a unique look. Very practical and feminine, it closes with straps and has leather details. 1 exterior zipper pocket and one interior pocket, for better storage.